Freedom! At last! Sorry I haven't been around much (I say this a lot, don't I? ^_^') Finals are over for the semester, and now I have a new computer! No more living off of 10gb! (I'm serious, my last hard-drive was that small!). Anyways, to celebrate these things I decided to make myself a new wallpaper to use on it, so here it is! 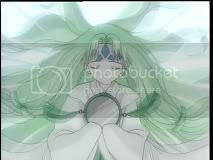 This time I walled the Mirror Card from Card Captor Sakura, and it wasn't easy to find any artwork of her! Okay, I didn't find any artwork, I had to vector a screen shot that was so small I had to look at it and vector how I thought it looked (no tracing this time). If you're curious, the image is here. For the background I chose a fabric with a cherry blossom pattern, and to get rid of the rainbow colors on it I had to filter and mostly repaint over the original fabric to get it in the right hues to match Mirror. While most of the girl was colored with the pen tool, I colored the mirror frame with the brush tool to give it more flare and added a texture over the background & vector to girl a more polished, marble feel. Since the Mirror Card is very simply drawn, I wanted to keep the wallpaper looking classy, but not overdone at the same time, and I also wanted to give her a little bit of sparkle, plus make her wings more ethereal and crystalline by giving them more lucidity. I'm personally pretty happy with this wall, so I hope you enjoy it, too! Edit: The reason my signature is where it is- because I've caught people stealing my wallpapers lately by editing out my signatures, but they have a harder time making it look right when it's signed over texture. I know it isn't pretty, but it's what I have been driven to by jerks. If you want to keep this from happening, crack down on places where you find stolen artwork. she doesnt got the ribbons! so shes still free, Sakura havent still sealed haha! the bg is nice, overall its a nice wall! How very pretty! :) You did great vectoring! Lovely colors and nice background. Cute screen shot of her you found too. Great work! Amazing job! I like greenish of wallie. Wow! It looks great! And you caught the right hues! :) Very lovely.. Anyway, I was like, "What? Is that Mirror?!" Hell, I'm a big fan of this card, really. And some other cards. The outer part of the hair needs outlines though. Clean vectoring, brilliant use of textures. Though I'm not fond of the background (what it has to do with Mirror?) and somehow, your signature is abit distracting the beauty of this wall. 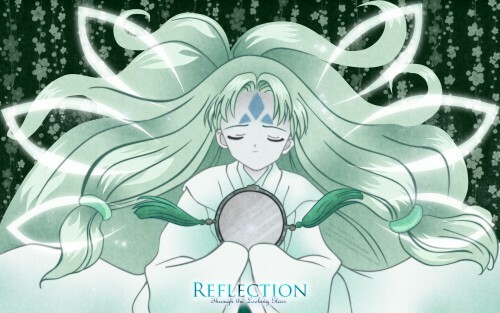 I love the mirror card (the clow cards comprise most of CLAMP's most beautiful artwork to me) and we definitely need more of this types of wallies on MT! ^^ I'm amazed at how far you've taken such a minute screenshot. Wai~! i better vector another mirror card >D ^^"
look like she in the forest ^^"
Yeah.. your sig a bit distracting there ^^"
a lovely wallpapaser of the mirror card! Wooooooow! This bg is amazing! This was by far the best card on the whole book from the series... loved the chapters when she made an appereance. Really nice wall.